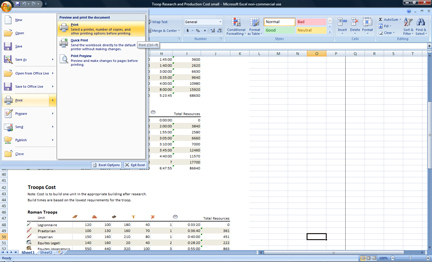 If you are searching for a method to transform an Excel spreadsheet into a TIFF or JPEG, there is a very simple solution. This one is so simple it will have you shaking your head in disbelief. All you need to do is copy what you need in Excel, paste it into an open Photoshop or GIMP file, and then save it as TIFF or JPG. I searched for free converters, and there are some out there that did an amazing job but 9 times out of 10 the formatting was not parsed correctly and the spreadsheet looked different after the conversion. If you do not have Adobe Photoshop, you can download GIMP as a free alternative. If the fist method does not float your boat, try this no brainer. Download the free pdf creator PrimoPDF. 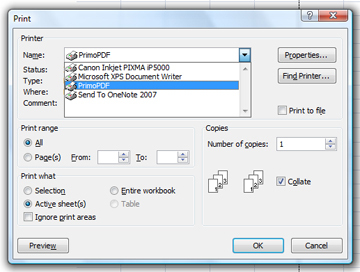 After this nifty application is installed, all you need to do is follow the same steps in excel as if you where going to print the spreadsheet and select PrimoPDF as your printer. PrimoPDF will then open up automatically and allow you to chose output settings and location you want to save.